Wedding season is quickly approaching and I am head over heels for all things stationary. I mean, I truly can’t get over how many options are out there to create such gorgeous stationary for your wedding day. As someone who got married over 7 years ago, I didn’t have a ton of options at my fingertips, but nowadays, the internet is flooded with incredible stationary. So, when I was asked to partner with Basic Invite, you can imagine how excited I was to check out all of their products! From wedding websites, invitations, the best wedding save the dates, custom wedding coasters (and more), they have it all. I won’t lie, I’m a little envious this company wasn’t around when I was getting married! However, that’s why I’m here sharing this with you guys today! Basic Invite is one of the few websites that allow customers nearly unlimited color options on all of their products - that’s CRAZY! Take a peek below at some of the best wedding save the dates I put together as well as some gorgeous custom wedding coasters to show you just how beautiful they are! Also, hold tight to the bottom of the post for a discount code you can use to get 20% off your order! Choosing a handful of wedding save the dates to sample was SO HARD. Honestly I wanted to sample all of them because they have so many beautiful options! From traditional, to modern, to photo cards, your options are nearly unlimited. I also love that they all correspond to a matching invitation suite so everything within your stationary ties together. They also all match with free wedding websites! I mean, c’mon! How dreamy is it to have a matching aesthetic all the way through your wedding details? I love it! 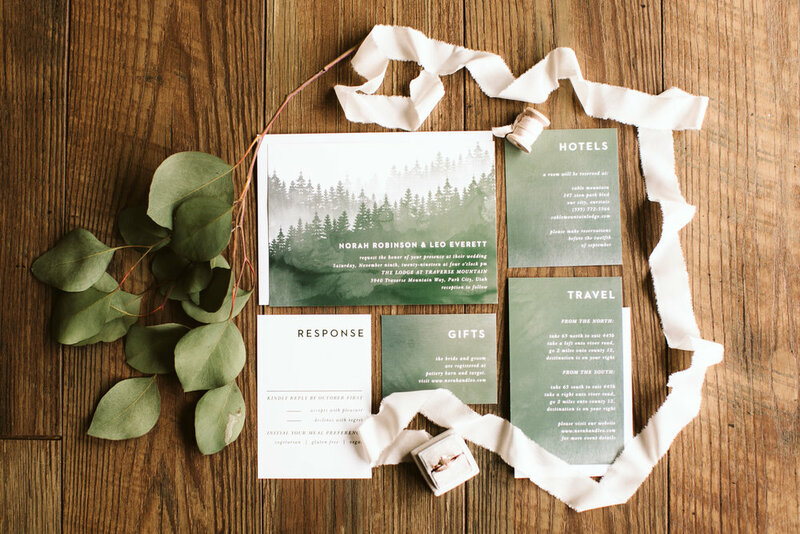 This set right here is the Forest Watercolor Wedding Invitation Suite and I am head over heels in love with it! It’s part of a huge stationary set including (but not limited to) save the dates, wedding invitations, enclosure cards, wedding menus, wedding programs, and even matching thank you cards! You can even customize this set down to the color of your mountains - seriously I could have made it bright orange if I wanted to! With over 180 colors to pick from your options are out of this world! 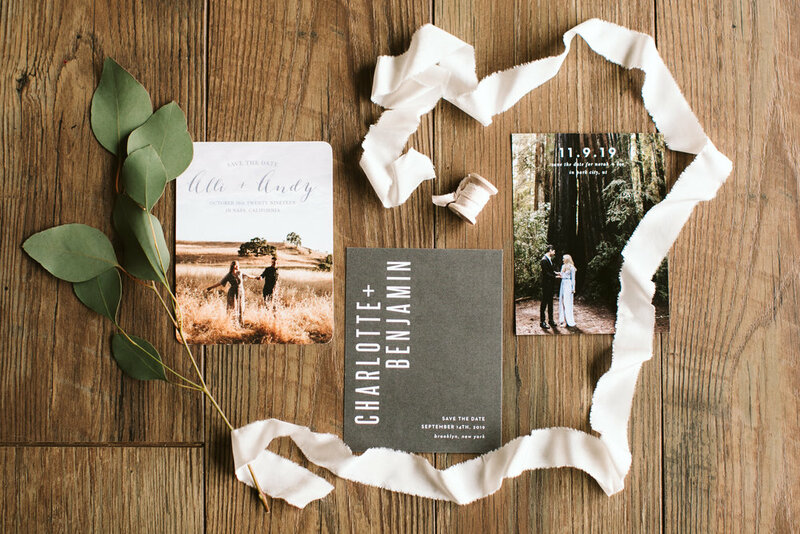 Basic Invite is also one of the few websites that offers the option of ordering a sample of your wedding invitation so you can see and feel the quality of the paper and printing prior to placing your order. I just love that they stand behind their products so much! Lastly, I can’t get over these coasters. I actually made them for a client of mine that’s getting married in France next year and I LOVE them. With over 90 gorgeous designs to choose from and each fully customizable to your own wedding colors, the possibilities are endless! They’re also printed on thick 200 lb. matte cardstock (which is THICK) and feel completely luxurious in your hands. All in all, my experience in working with Basic Invite was truly so easy and fun. When the products arrived, they came faster than promised and arrived well packaged and with a really great brochure from the company with all kinds of information. I am so excited about their products, I’m actually going to be ordering some of my own stationary from them for my business! If you guys have any questions what-so-ever about anything, don’t hesitate to shoot me an email. Also, use the code below here (my name) for 20% off your own order! Enjoy!